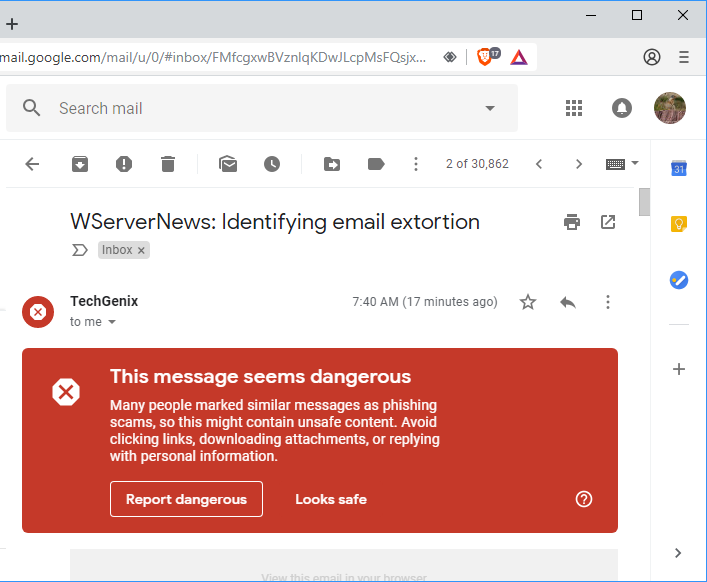 Last week in Issue #1221 Identifying email extortion of this newsletter I shared a story of how I identified a threatening email message I received about my machine being hacked as being a spoofed email. I ended by asking how our readers identify and deal with flood of spoofed emails and the threats they sometimes contain, and several of you responded with helpful comments on this subject. So in this week's newsletter we have a selection from the feedback we received from our readers on this topic. Enjoy, and don't forget to check out all the other useful, informative and entertaining stuff in this issue of WServerNews! for the last few years and that the IPs from where I receive such emails are included into such list. This way I do not keep receiving such emails from the same IP and I force the extortionist to get and use another IP before he can send me any other letter, be it from a mobile phone or from a pc/laptop. They usually change email address and subject to fool your spam filters, but they do not have a wide number of IPs to use for such. The most insistent one I remember was using about 23 IPs. Once I added them to the offending IPs list I never received any other extortion mail from him. I here below include the list of IPs and the address names he used for you can check he was using a network of hacked systems to do his extorting attempts. No need to say that I am sure about the fact that nobody is going to send you an extorting email from his own mobile because he can be caught as soon as you file the due complaint against the extortionist and include the sender's IP. The extorter is probably sending you the mail from a hacked device. Once said so, if you are thinking about the loss of functionality of my Offending IPs list customers systems (web, email, online databases, etcetera), they do not worry about at all due to the fact that a few IPs that may be used for extorting are a water drop in the ocean of Internet. If the ISPs do not mind about preventing such abuse on their resources, we do not mind of putting their misused IPs into our list. Much more important is the number of IPS used for hacking and abusing attempts that have been recorded inside our Offending IPs list. It has now more than 70.000 IPs that we offer our customers, for a very low monthly fee, so they can upload it to their firewalls and update it several times a day. I do believe that a good security infrastructure for our connected systems begins with the best perimeter defense. Hey Mitch, Funny, I got that exact same email. Almost word for word. It was actually in my Junk mail, not the inbox. I usually give my junk mail a cursory look, to check for thinks that may get there when they shouldn't. This only caught my eye because they referenced an old mail password that had gotten hacked years ago, like 8 to 10 years. And that password had long been changed and not used again. That was the only reason I even gave it a second look. My first check (email address is correct) led me to an interesting one. There is an even more interesting spear phishing attack going on right now. The attackers are going after contacts from accounts that they already captured. My Mother's account was compromised. I got an email from her, and the address was correct, so I looked a little deeper. They sent me an email saying it was a link to OneDrive, with an attached PDF which I assume was infected. The link goes to a site "specialeventcruises . com" and tries to get you to enter your credentials on a fake web page. The more interesting thing is they are monitoring the accounts and replying to emails. I verified my mother was not on the computer at the time, then I opened my mother's email to watch it. I sent my mother some emails that AM. My 'mother' replied to them, trying to tell me that the site was fine. So, I asked for my sister's name, they got that right, must be checking social media. However, they got my older brothers name wrong. :) Oops, I don't have one! All while I was on the phone with my parents; who were not on the PC. The funny part it that my mother had been complaining to me that she would be in Outlook and see an email appear in her Inbox, and then disappear. I could not figure out what was going on, until this. I found this quite funny given the topic of last week's issue. It only goes to prove I suppose that even a zillion dollar company like Google (Alphabet) that says it's betting the company on AI still has trouble identifying whether emails are phishing attempts. Email us at [email protected] if you're an email expert and have any thoughts about this or any other aspect of dealing with phishing emails, one of the biggest security issues companies face today. Join Veeam for a series of global webinars about Veeam’s partnership with AWS! We’ll cover all sorts of information about the AWS cloud, Veeam cloud tier and Veeam Availability for AWS. Do your co-workers ask you to find and restore emails from backups? With a professional email archive users can restore emails on their own. Try MailStore Server and its ‘One-Click Restore’ free for 30 days. Question: What kind of music would you prefer your local coffee shop to play over their speakers? Answer: The Ruttles, Garfield and Oats, Spinal Tap, Weird Al Yankovic, Sing along with Mitch (Miller). Oops. Typo. Its Garfunkle and Oats, not Garfield. My mistake. Question: How do you think U.S. federal, state and local governments will respond to this problem? And what about other jurisdictions like the UK, Europe, Australia, Canada etc? Is road maintenance funded differently in your country? The Cisco Intersight virtual appliance is for organizations that have security requirements for systems stored on the edge or in traditional datacenters. SHA-1 encryption was determined to be ineffective 14 years ago. Microsoft is finally taking steps to eliminate it once and for all. As cloud computing becomes the norm, bigger companies are snapping up smaller ones. Here are last year's top cloud computing acquisitions. Slack is the go-to collaboration tool for many, but Microsoft Teams is closing the gap. This battle between startup and established giant is just beginning. This week's Xtreme Podcast: Hey Microsoft and Apple — what's the big idea? Also, cash isn't king, but cloud service providers are. Microsoft is bringing its virtual desktop offerings into the cloud era. Learn more here. Microsoft hopes to accelerate customer cloud desktop adoption when it makes the Office 365 ProPlus suite a cloud-only product for Windows Server 2019 RDSH users. Keep reading now. Discover the latest features from Apple and the new iOS 12, an operating system that will give IT more control over iOS device management and security in the enterprise. Learn more here. Ansible is a configuration management offering that runs on Linux but controls Windows systems with PowerShell. Find out how to get the tool running in your data center.